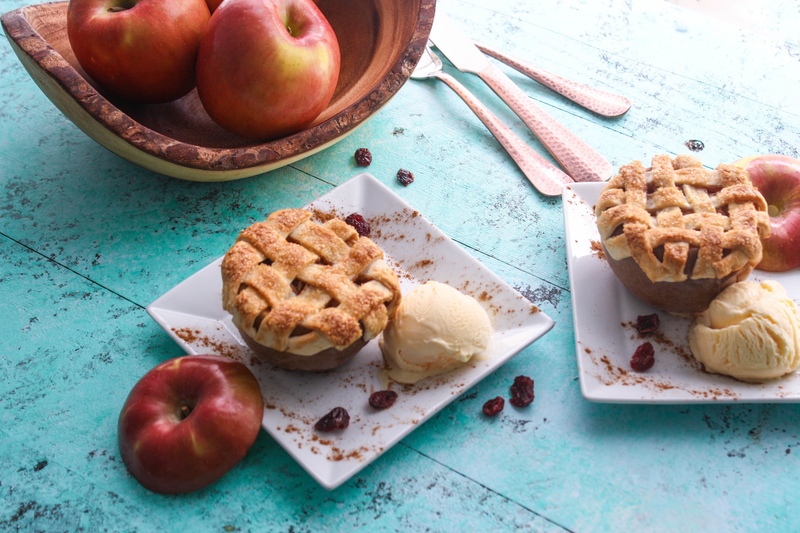 Apple-Cranberry Pie Baked Apples are fun treats served up in individual portions. 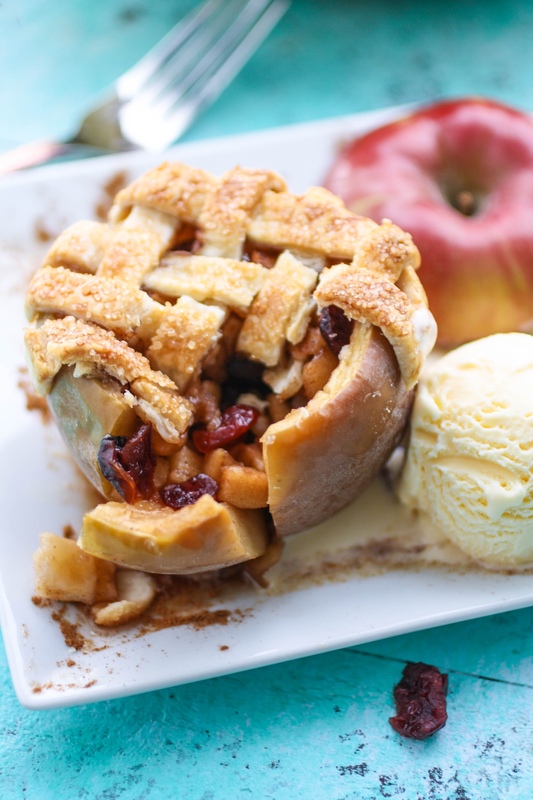 Baked apples are like dessert comfort food, and this version combines a lattice pie topping for that traditional apple-pie feel. I mentioned in my last post that I had had a few recipe fails recently. One was a pie. I mean, really. A pie? Well these “pies” turned out perfectly and I did a little dance around my kitchen to strut about my success! If you want a sure-thing apple pie recipe, you should try my Skillet Apple Pie with Salted Caramel Whipped Topping. Such a delightful dessert! For a more whimsical treat, try my Cranberry-Apple Pie Spring Rolls. 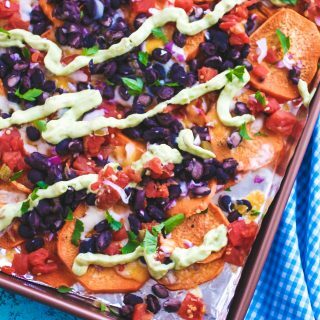 These are fun to serve for a party, and they’re so tasty! When I was little, my mom used to make baked apples during the fall and winter. She simply baked the apples until they were soft and then we’d enjoy them while they were still warm. I don’t recall eating those baked apples with ice cream or whipped topping, but with just a bit of cinnamon sprinkled over the top. I loved them! 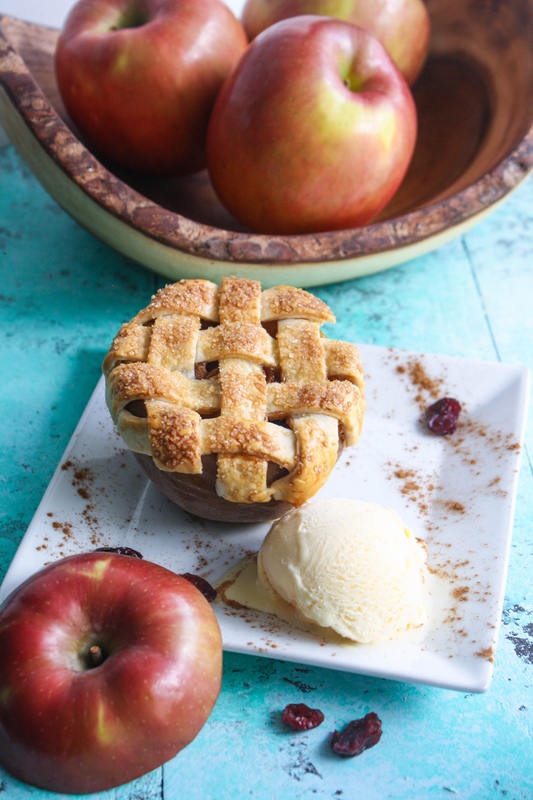 These baked apples are easy to make and take on the traditional apple pie feel due in part to the pretty lattice crust over the top. I did serve these baked goodies with a side of vanilla ice cream because that’s how I roll, but whipped topping would work well, too! I stuffed these apples with a mixture made from part of the apples, dried cranberries, and seasonings like brown sugar, cinnamon, nutmeg, and ginger. Even the lattice topping is easy to form. I used a prepackaged pie crust for this recipe, but if you’d like to make your own, use my tried-and-true pie dough recipe. Do you make baked apples? How do you serve them? 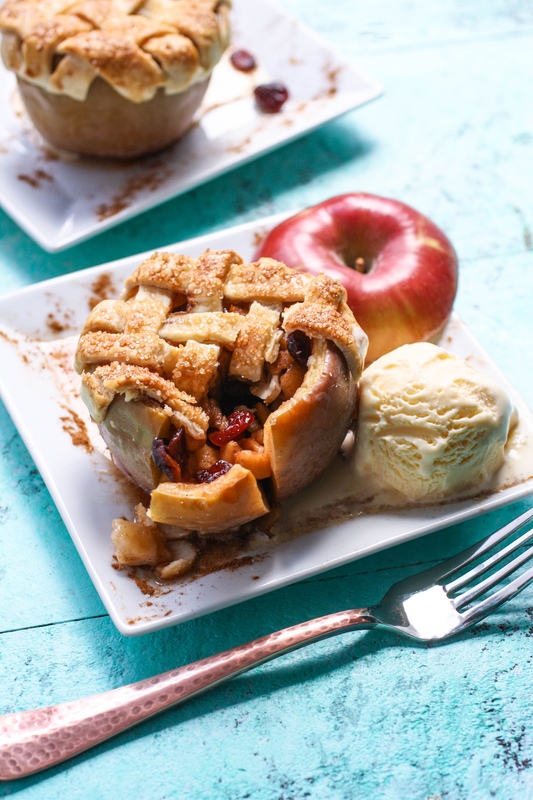 When you don’t have the time to make an apple pie but you still want that traditional taste, these Apple-Cranberry Pie Baked Apples will wow you. Did I mention your kitchen will smell delightful as these apples bake? Mmmm… smells a little like fall. I hope you give these a try and enjoy! Preheat the oven to 375 degrees F. Add some water to a baking dish, about 1/4-inch up from the bottom. Set aside. Slice about 1/4-inch of the tops from the apples. Use a pairing knife to carefully cut around the inside of the apples, leaving about 1/4-inch wall around the apples. Score inside the wall of the apples in both directions, almost to the bottom. 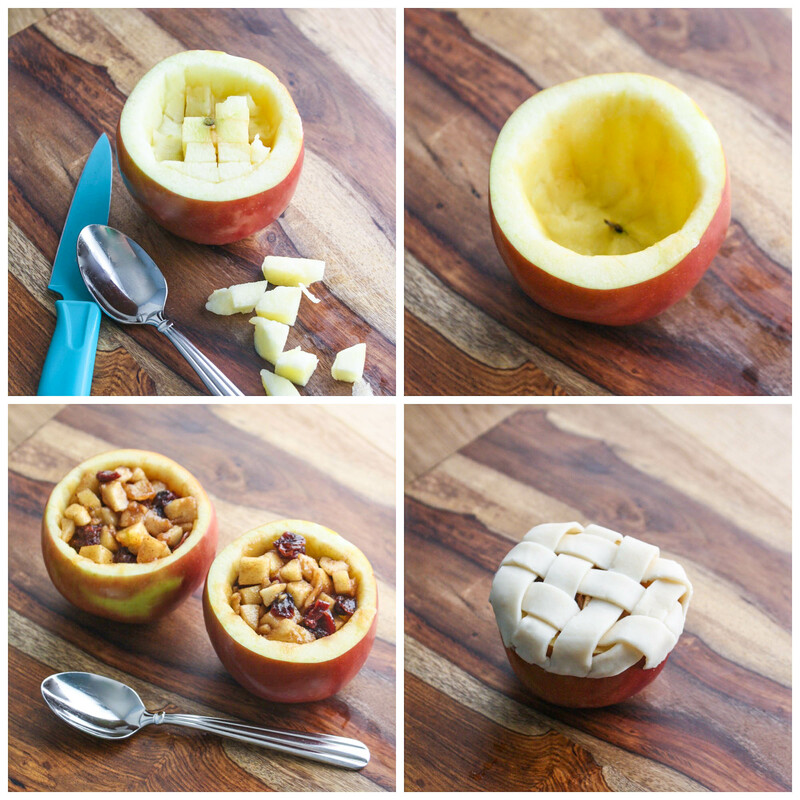 Use a small spoon to carefully scoop out the apple pieces, and remove the cores. Add the apple pieces to a bowl and add the lemon juice, along with the cranberries, brown sugar, cinnamon, nutmeg, and ginger. Toss to combine. Evenly divide the mixture and transfer it back into the hollowed-out apples, lightly pressing down on the mixture. Place the pie dough on a clean, flat work surface. Cut strips from the dough, about 6 inches long and 1/4-inch wide. You’ll need about 28 strips for the four apples. You may need to gather up the dough scraps and roll them out flat to cut additional strips. On the flat surface, weave about seven strips for each apple into a lattice pattern. Carefully lift and place each of the patterns over the top of each apple. You may need to adjust the strips as you place them. Trim off any excess dough, so there is only about an inch hanging over the apples. Press a few of the strips together at the ends, and gently press them onto the surface of the apples. Add the egg and water to a small bowl and whisk to combine. Transfer the apples to the baking dish. Lightly brush the egg mixture over the tops of the pie dough. Sprinkle with the sugar and place in the oven for 20 minutes. Rotate the pan and bake for another 20 minutes. You may need to cover the apples lightly with foil if the tops are turning too dark. Remove and transfer from the baking dish. Serve warm with vanilla ice cream or whipped topping. These look so relish and easy. Can make them easily for dessert this evening. MY house will smell so womderful I might to see Kim cleaning it, lol. There you go! Did you try them? Thanks! Could there be a better fall treat? I love this! The cranberries are a great addition ! Thanks so much, Dorothy! You could include so many different things! Woo-hoo!!! These apple-cranberry pies look so yummy. Every fall my family heads to Apple Hill, about an hour and a half from Sacramento, CA. Throughout the area you can pick apples directly from the trees or buy them freshly picked by owners of the various farms. After purchasing scrumptious apple pies and apple cider, we come home with a large bag full of apples. Your recipe will be enjoyed right here in my home this season. How fun to go out and pick your own fall fruit! Love it! Thanks, Denay! OK these look seriously PERFECT! Saving this! Thanks very much, Carrie! Hope you have a chance to try them! This looks cute and delicious. These would be great for a gettogether with the girls. I am definitely going to try to make these. Thanks so much! I hope you try them soon, and everyone enjoys! Thanks very much, Tori! Hope you get to try them! Yes, a little healthier and still delicious! Thanks, Oyinkan! I am in love with this! I love the individual dessert option! These look SOO incredible! I can't get over how pretty they are! So perfect for fall! Thank you, Adriana! I hope you have a chance to try them! These are the cutest little fall desserts! These would be so great for thanksgiving! That's an excellent idea, Jessica! Hope you get a chance to try them! Thanks!